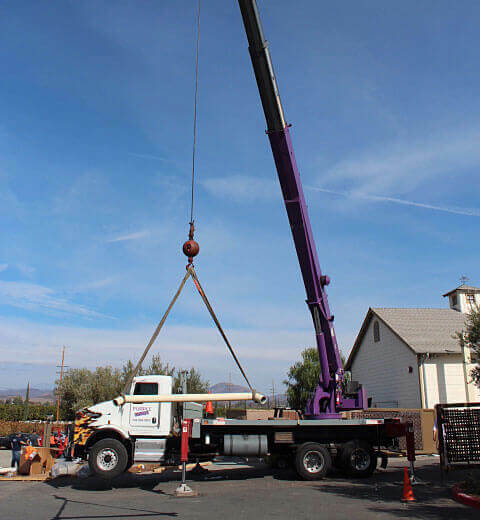 Purple Crane is a family-owned, full-service crane rental company that has been serving Southern California since 1983. We're committed to offering expert service and the best equipment at a great value. We have the knowledge and experience necessary to determine the right crane for your job, minimizing the time and cost of your project: we guarantee that we'll get you the right crane the first time, every time, and that our cranes and operators will arrive on time. We offer a full range of affordable, high quality crane services throughout Southern California, as well as fast, reliable truck and trailer transportation. We can handle the lifting and transportation of almost any item, from start to finish, with a crane at each end to assist with removal and installation. For air conditioner removals, we'll even haul the unit to a certified recycler at no additional charge. Our state of the art cranes range from 3-ton to 75-ton capacity and reach up to 165 feet. Our heavy-duty trucks and trailers can carry loads of up to 15,000 pounds. For projects that require a suspended personnel platform, we offer safe, reliable man baskets that can hold up to 2 men, or 500 pounds. Our services are available 24 hours a day, 7 days a week, and we respond quickly to all emergency calls. All of our crane operators/drivers have between 9 and 40 years of experience in the field, with full certification from NCCCO (the National Commission for the Certification of Crane Operators). Purple Crane is an OSHA-compliant company, and we're fully insured. We can provide same-day certificates of insurance whenever necessary. Over the past three decades, we've performed more than 75,000 lifts for residential and commercial projects throughout Southern California, including air conditioner removal, transportation, and lifting; construction material lifting, removal and transportation; machinery removal, transportation, and installation; utility projects; landscaping; and more. We've worked for a variety of clients, moving a wide range of items: shipping containers, building materials, trees, air conditioners, spas, and much more. Call us anytime, day or night, to speak to a live phone representative. We're standing by, ready to answer your questions and offer you the most competitive rate for your crane rental needs. Our crane services are available 24/7 for your convenience.